The death of Heather Heyer in Charlotesville in August this year during the Unite the Right march, attracted an unprecedented – often hostile and under-researched – focus on ‘antifa’. The mainstream media and the ‘small-l’ liberal critics on the Left alike were united in condemnation of what they misinterpret as an ideological equivalent to Antifa’s main opponent, the neo-Nazi and white supremacist groups rising in the political vacuum left by the failure of the neoliberal project. It is interesting that this attention had not come earlier. Not until the death of Heyer, a white woman involved in the anti-fascist movement, has there been any serious attempt to understand the organised collective defence against fascism. This betrays more than just the conservative bias of what passes for public discourse, but a larger failure to comprehend the emergence of new political faultlines and the major distrust of the political class across the electorate. The liberal democratic project is in a serious crisis, if not on its death bed. Antifa is a response proportionate to the immense threat to the global commons that this crisis personifies. ‘Antifa’ is short for ‘antifascist action’, with modern origins in the 1970s continental Europe and the UK, and emerged as a radical response to the neo-Nazi infiltration of sporting clubs and the underground music scene. Antifa involves more than just stated political opposition to anti-fascism: it is a radical re-conceptualisation of antifascist resistance which includes a critique of capitalism, and aims for its total obliteration, along with the hierarchies and oppressions it engenders. The basic premise of Antifa is to deny the political platform to all expressions of fascism and neo-Nazism. The wrongful assumption that ‘violence’ stands alone as an antifa tactic, underscores liberal critiques of antifa, but is generally blind to the ‘construction’ work performed by the broad band of communists, socialists, and anarchists comprising the umbrella term. Mass mobilisation; base-building; reconstruction of the commons; critical pedagogy in education and training; collective action. These are the lynchpins of twenty-first century resistance to fascism. The basic premise of Antifa is to deny the political platform to all expressions of fascism and neo-Nazism. 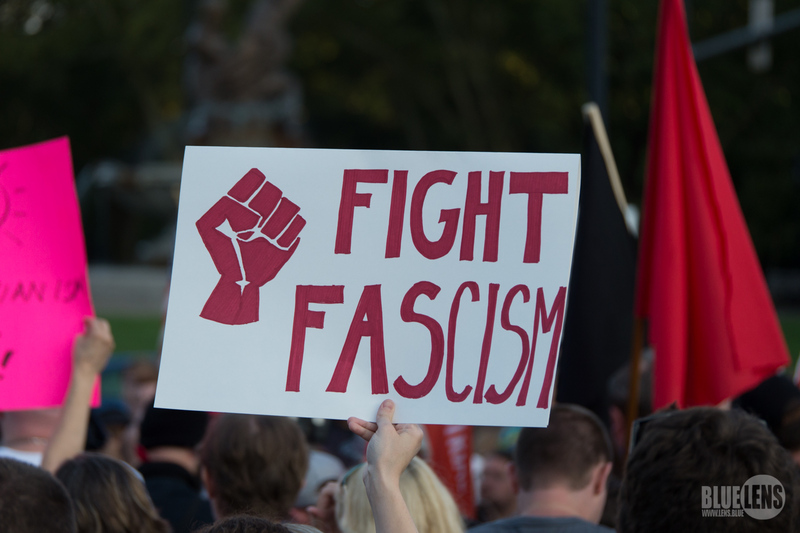 We collect intelligence about individual neo-Nazis and fascist groups; we promote a critique of fascism which disavows liberal assumptions about civil discourse and political debate as the legitimate and effective tools in anti-fascist resistance; we oppose social, political, economic hierarchies – white supremacy being a major one – that prop up the current global capitalist system. Most importantly, we organise people where they are at: in the workplace, at a community centre, at the local library. Australian organised far right is often mistakenly perceived as small, politically isolated and insignificant compared to the neo-Nazis in the US and Europe. The earlier manifestation of white nationalism in the form of Reclaim Australia, is spoken of as a brief political moment rather than a real and ongoing threat to the marginalised communities, especially First Nations peoples, Muslims and people of colour. Yet we insist that the harbouring of neo-Nazi and fascist groups by movements such as Reclaim Australia, should be taken seriously, as should the co-option of the far-right logic into the mainstream electoral discourse by the ruling political class. For example, the Party for Freedom’s scheduled rally in late September in Sydney, is more than just a symbolic show of (relative) strength, but is designed to claim the streets, the very commons that has been endlessly corporatised and contested under neo-liberalism. Great thinker Primo Levi wrote about the concept of ‘useful violence’ as applied to Nazi extermination camps: recognising the agency of Aryan supremacy which has its determined goal: the destruction of European Jews and expropriation of the eastward lands. Today, white supremacy, racism, and the renewal of neo-Nazism, represent yet another manifestation of ‘useful violence’, whose horror parallels the historical processes which in the 1930s led to the Second World War. Let me put this another way: the world is not that different to the world of the 1930s. Anti-globalism which the neo-Nazi groups are tapping into the disenfranchisement and demonisation of the working class; the exploitation and looting of the Global South; the patterns of late neoliberal wealth accumulation which leave the vast majority of the global population shut out from the landscape of progress that is the narrative of late capitalism. Micah White recently remarked that the political sovereignty, once the mandate accorded to governments by the will of the people, now stems from whoever can exert political, military and economic authority and control. This is both the context for, and the effect of, the fascist revival. The question of whether or not antifa response is effective, morally justified, or desirable, elides the fact that antifa’s ‘violence’ is defensive resistance. 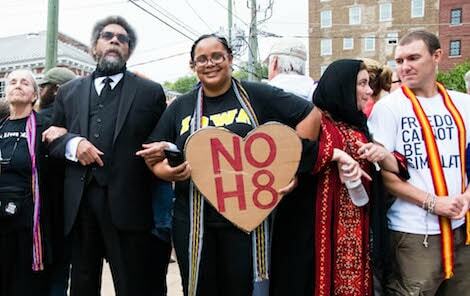 In Cornel West’s words, Antifa saved the lives of many in Charlotesville that day, and will continue to do so. This is an extract from an article published in Waging Non-Violence. You can read the full article here. Nazism and white supremacy are forms of violence. Let’s start there. The constitution does not protect violence, and I’m happy to see that the California chapter of the ACLU has taken a stand against protecting the “free speech” of hate groups. But with or without marching permits, it is clear that public displays of hatred are a growing trend in the United States. And as much as I don’t want to give these groups more attention, it is also clear that simply ignoring them is not going to make them go away. Many communities seem to have embraced the militant tactics of Antifa, so much so that it seems like it’s already an expectation that every alt-right rally will turn into a violent battlefield. Yet I can’t help but wonder if these tactics are giving the alt-right exactly what they want. Is it possible that we could be winning small battles while losing the war? Is it possible that as we celebrate Nazis getting punched, their numbers are growing as a direct result of it? I don’t pretend to have all the answers. I would even admit that a portion of the blame for the rise in violence has to go to those of us committed to nonviolence for our failure to come up with the type of assertive response necessary in these urgent times. And I do give a lot of credit to Antifa activists, for as much as I have major disagreements in strategy, they have had the courage to put their bodies on the line. When the levels of hatred are as extreme as they are, our responses to it — nonviolent or otherwise — has to match its intensity, and Antifa has done that. But as these battles rage on (the alt-right has planned rallies this weekend in San Francisco and Berkeley), it’s critical that we not get dogmatic and are able to evaluate our strategies. Violence has a simple dynamic that Rev. James Lawson once described as, “I make you suffer more than I suffer.” If we think that punching Nazis and pepper spraying them will make them suffer so much that they go away, I’m afraid that we are severely underestimating their commitment to their cause. Right or wrong (spoiler: they’re wrong), they feel like their culture is being threatened and white people are being oppressed. As the adage goes, “when you are used to privilege, equality feels like oppression.” If members of the alt-right already feel like they are being oppressed (and they do), using violence to shut them down may only make them dig down even deeper into their hole and fight back even harder. We also need to stop thinking that going head-to-head is the only option we have. There is so much diversity within nonviolence, and we are doing ourselves a disservice when we don’t fully utilize our creativity. My favorite example of this is a dilemma action where the German town of Wunsiedel turned a Nazi march into a walk-a-thon for an anti-hate group organization. Residents committed to donating money for every meter that the Nazis marched. When the marchers came to town, the residents welcomed them, celebrated and thanked them for raising money to fight Nazism. Or when clowns showed up to counter a KKK rally in Knoxville, Tennessee. It’s hard to fight when the other side is dressed like clowns, and the images don’t make for good recruitment either. Or what if instead of trying to stop them, we mix in with them with signs opposing hate? If our signs outnumber theirs, again their photo-ops would become useless. What if we hold massive banners and completely surround them, not letting anyone see them? What if instead of shields and sticks, every person came with instruments, pots, pans, air horns and drums and completely drowned them out without actually trying to stop them? What if we go to the site of their rally the night before and somehow transform the site itself? Maybe paint the entire ground a bright rainbow? What if we coordinated the “Yes, You’re Racist” Twitter feed and tried to take pictures of everyone who shows up at the event? Members of the alt-right have already had their businesses boycotted, been fired from work, had their accounts suspended from Airbnb, social media and even the dating site OK Cupid. At the end of the day, the most important thing for anyone reading this is to be ready to mobilize every time the alt-right gathers. The fewer counter-demonstrators there are, the more likely it will be that violence will erupt. The more counter-demonstrators there are, the more likely that the alt-right will simply run away. For those of us committed to nonviolence, it is easy to criticize people who have played a role in escalating violence. But if we are not at least in the streets with them, then our criticisms ring hollow. If we believe that we can defeat hate by building a popular movement, then we need to get into the streets and create one. Violence vs. nonviolence is an important question, and a complicated one. A less complicated one is the question of action vs. inaction. Regardless of where you stand on nonviolence, if you stand for inaction you are helping hatred gain steam. ← Previous Article The Threat Of The Far Right: Why Take It Seriously?